The BC Liberals are under investigation by Elections BC and the RCMP after The Globe and Mail revealed the party is accepting illegal donations from lobbyists, specifically highlighting donations by Byng Giraud and Marian Ngo from Woodfibre LNG, which proposes to construct and operate a liquefied natural gas (LNG) export facility on the old Woodfibre Pulp and Paper Mill site near Squamish, British Columbia. But this latest scandal is simply business as usual for Woodfibre LNG, which is owned by the notorious Indonesian billionaire, Sukanto Tanoto, whose companies have a history of tax evasion, animal rights violations and human rights offences. And let’s not forget the vice-president of Woodfibre LNG, Byng Giraud, who has been linked to a robo-call scandal and used to work for Imperial Metals, the company responsible for the Mount Polley mining disaster. Nice guys. 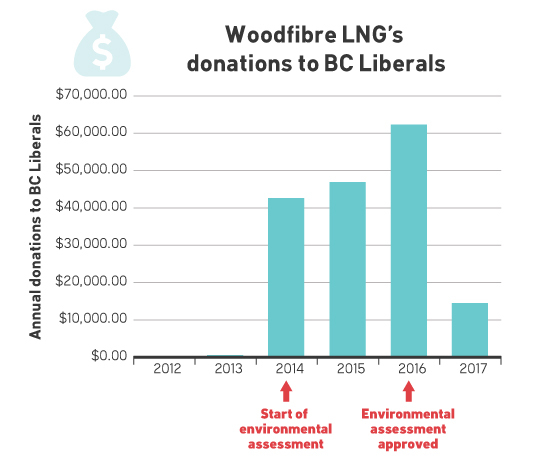 This most recent scandal prompted our team at My Sea to Sky to dig a little deeper: When exactly did Woodfibre LNG start donating to the BC Liberals? How much have they actually donated? By our count, Woodfibre LNG and their staff have donated at least $166,934 to the BC Liberal Party since 2013. Donations start to ramp up almost immediately after the substituted environmental assessment was approved, putting the provincial government in charge of conducting the environmental assessment on behalf of the federal government. Nevermind that B.C.’s Minister of Natural Gas Development, Rich Coleman, who was responsible for reviewing the environmental and social impacts of Woodfibre LNG, also has a mandate to develop an LNG export industry — and he’s one of the BC Liberals’ largest fundraisers. Sure, let’s ignore that conflict of interest. There was also a flurry of Woodfibre LNG donations right about the time that the BC Liberals unveiled Bill 6, the LNG Income Tax Act, which halved the tax on LNG export facilities to 3.5 per cent on net income. This means B.C. now bears all the risk with no reward as profits may never be realized. Donations continued over the summer of 2015, leading up to the inevitable rubber stamp approval of Woodfibre LNG’s environmental assessment certificate by Ministers Coleman and Polak. 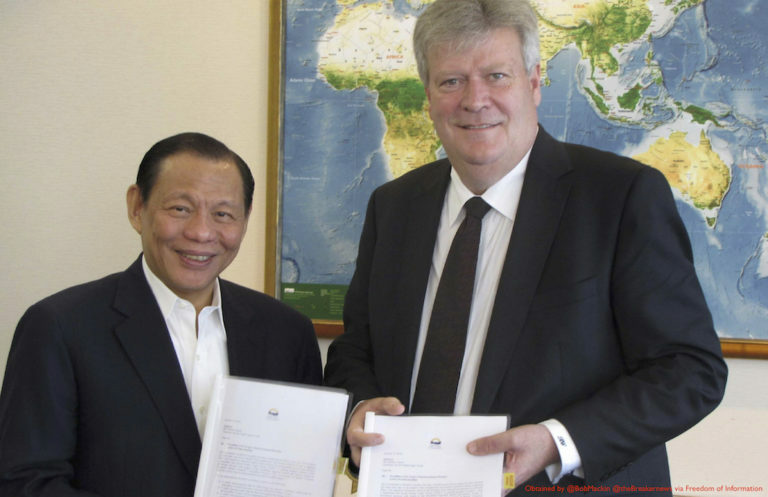 And money kept on pouring into BC Liberal coffers, with some of the biggest donations in late 2016, right about the time Rich Coleman flew to Singapore to meet with Sukanto Tanoto. They signed an MOU that the BC Liberals have refused to release to the public and posed for a photo. A few weeks later Premier Christy Clark flew by helicopter to the Woodfibre LNG site to put on a hard hat and announce to media fanfare that “Woodfibre LNG is a go” thanks to a new e-Drive subsidy worth $34 – 45 million every year. By the way, this means your hydro bill will go up so Woodfibre LNG can have cheap power. Oh, and there will be yet another tax break for Woodfibre LNG as the BC Liberals eliminated PST on clean energy purchases (including LNG) in February 2017. That’s a pretty good return on $166,934. And the donations will keep coming to Christy Clark and the BC Liberals as Woodfibre LNG now has applied for an amendment to their environmental assessment certificate. Has big money corrupted the environmental assessment process? Has Woodfibre LNG bought a rubber stamp approval for the project, along with other political favours including tax breaks, tax exemptions and the e-Drive subsidy? These are questions Premier Clark will have to answer before we go to the polls on May 9th. As well, Woodfibre LNG owns an Independent Power Project, which sells boutique-priced power to BC Hydro. But I doubt they will play hardball — unless the BC Libs are booted. This is outragous! I have a cabin on Bowyer Island but cannot vote in he BC election since I’m not a BC resident, I am however directly impacted by any accident that should involve an LNG tanker. How can we give away our beautiful Howe sound to increase the coffers of a billionaire who doesn’t care a hoot for us? !